Up until now I hadn’t finished my last two races, I’d had too much time off the bike and I wasn’t sure how I would get on. 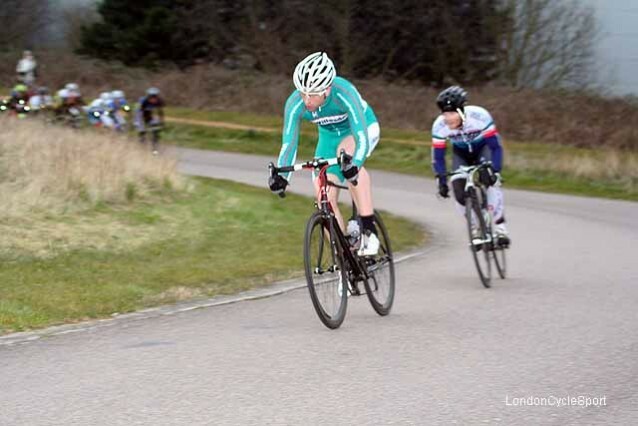 I had the choice to ride in the E/1/2/3 race but I wanted to try and win one of the 3/4 races first. I knew the race would be short as there isn’t much light in the evenings just yet so I was prepared for lots of attacking. I had been warned that the Kingston Wheelers would be riding and that they would have several riders present, I’d heard of Gareth Thomas before as he’s been riding a while and because he finished an excellent 2nd at Milland Hill. I knew Gareth was the rider to watch which with hindsight made my ‘tactics’ seem even worse! I rode quite sensibly for about 2 laps, then the first break went which included riders from Kingston wheelers. It’s not often you see tactics used effectively in a 3/4 race so I didn’t read too much into it but the two Kingston riders didn’t seem to want to do any work. I think on that occasion we realised that no commitment was going to be made so we just sat up. Other breaks were going off and again there was at least one Kingston rider in each break, again sat on the back and unwilling to work. About half way into the race a friend of mine who is a strong rider attacked, I went with him and so did two riders from the Kingston, at the time I was trying to encourage them to ride with us. They had two riders in the break so it surprised me that they wouldn’t work with us. I felt really strong though so I wasn’t going to let that stop me and I continued to push on as hard as I could to keep the pace up. We got to the line as a group of four and the whistle went for the Prime lap! I didn’t really know what to do at this stage because I didn’t want to gift the Prime to a Kingston rider but at the same time I knew that Gareth was still in the bunch and that he would attack after the Prime. I decided to attack on the long downhill section and try and win the Prime, perhaps I could have hung back a bit but I’d already committed myself to this move and I had a good gap. It would have been stupid to give up the Prime when I had it in the bag. I crossed the line on my own and won the Prime with a decent gap so at least I’d won my money back for the night. The effort was too much and as expected Gareth went off past me just after the Prime, I’m not sure how he attacked the bunch but he flew past me and it was clear that the Kingston Wheelers tactics had worked well. From then on Gareth’s team mates worked well together, there wasn’t a move that they weren’t in and if they missed any, then they just rode on the front and brought things back together. I’d hoped to win one of these races and so I hadn’t really thought too hard about what I would do in this situation so my tactics got worse. I should have sat back, accepted what had happened and saved my efforts for the inevitable bunch sprint and maybe picked up 2nd place, instead I just kept attacking and wearing myself down. I did calm down a bit at the end though and positioned myself reasonably well for the sprint, I was just about to hit full gas and over take a couple of riders in front of me but the rider in front of me switched from the left and moved into the slipstream of the rider next to him and that unnerved me a little so I backed off a bit but that was my fault for not sprinting from the front. I picked up 5th in the sprint and 6th overall so I can’t be too disappointed but I felt really good so it was a shame to miss out but I rode really badly and I should have maybe just stuck to Gareth for the entire race as I’d planned too. Well done to the Kingston Wheelers riders for riding so well, one of their riders even took 2nd in the sprint so it shows how well they were riding together. Video highlights courtesy of UKcyclesport.